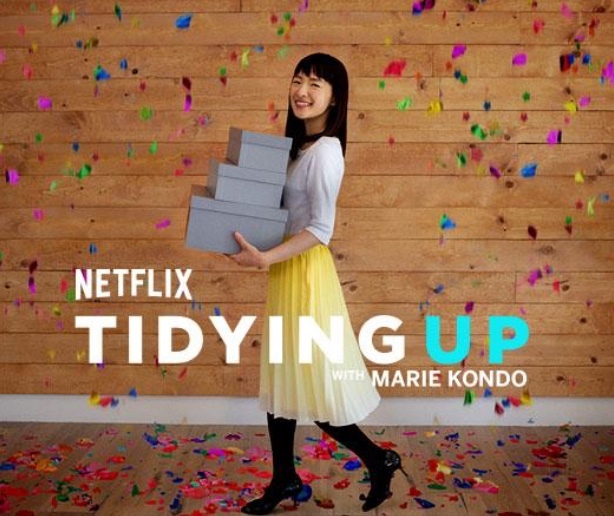 Marie Kondo is at it again with her new Netflix series, Tidying Up with Marie Kondo. You may already be familiar with the KonMari method through her hugely popular book, The Life Changing Magic of Tidying Up. We live in a culture of consumption that really values volume. Coming from a totally different culture, Marie Kondo awakens us to a Japanese way of looking at our things. At the heart of her de-cluttering approach is the Shinto belief of animism– that objects have energy and a life force that should be acknowledged and honored. Usually the object of any de-cluttering method is getting rid of stuff. Kondo’s approach changes the focus of purging. Instead of analyzing objects for their functionality in our lives, she trains us to sense the energy within our possessions …and only keep those that inspire or create joy. Kondo’s technique is very spiritual and holistic – gets you out of your head and logic and into your heart and emotion. She’s asking what you want to carry forward with you in your lives.The end result of the process is an uncluttered home and a clearer relationship with the things you own. The KonMari method can work across all types of family structures and life scenarios. Are you feeling inspired to try a new approach but daunted by doing it on your own? We can help…some professional organizers are trained in the KonMari method, including our own Katherine Korlacki! You also don’t have to implement the KonMari method exactly in order to make progress – use the parts that inspire you and get support to get through the decision-making process. Your de-cluttered life awaits!